First year law student Janise Joseph-Woodard was supposed to be sitting in her criminal law class. Instead, there was an empty seat when her class met Tuesday night. Florida A&M College professors had to console her classmates after a small plane plowed into her home, killing Joseph-Woodard, 24, her 6-month-old son and three others. "Janise balanced law school, a family and a healthy marriage. And she did it well," classmate Nikeisha Ford said of the mother of two. The twin-engine Cessna crashed into a suburban Orlando subdivision Tuesday morning, spilling aviation fuel that ignited and gutted the two homes it struck. The victims included two aboard the plane: 54-year-old Dr. Bruce Kennedy, a Daytona Beach plastic surgeon and husband of International Speedway Corp. President Lesa France Kennedy, and NASCAR Aviation pilot Michael Klemm, 56. Also killed was a 4-year-old girl, Gabriela Dechat, who lived in a home beside Joseph-Woodard. Her parents, Milagros Dechat, 33, and Peter Dechat, 36, were seriously injured. A 10-year-old boy who was also in that home was transported to Cincinnati Burn Center with burns over 80 percent to 90 percent of his body, authorities said. His name has not been released. Police released a brief 911 tape that featured a woman's voice shouting "please help us" to a dispatcher while also yelling at bystanders to "get away from the house. (audio)"
The National Transportation Safety Board will focus its investigation on "man, machine and the environment," NTSB vice chairman Robert Sumwalt said. "We'll be reviewing the aircraft maintenance records and any other records associated with this airplane," he said. The investigation will also focus on any services the plane may have received before or during the flight, including fueling and maintenance. The plane was traveling from Daytona Beach to Lakeland Tuesday when the pilot declared there was smoke in the cockpit. It was not clear who was flying the plane; NASCAR said it was Kennedy, but investigators said earlier it was Klemm. The pilot was directed to land at the Sanford Airport but air traffic control lost radar contact. Authorities permitted it to land at any runway, Sumwalt said. At the crash site, rescue crews arrived to a "heavy, dark column of smoke" worsened by the airplane fuel. "The plane's in numerous pieces throughout the five or six homes' backyard," said Matt Minnetto, an investigator with the Sanford Fire Department. Eric Domnitz, who lives down the street, hurried with a fire extinguisher when he heard a woman scream. He said he discovered a horrific scene. "It's in my head. The woman was just melting. It looked like her skin was just melting off," he said. "The guy, he was melting. He looked like wax." 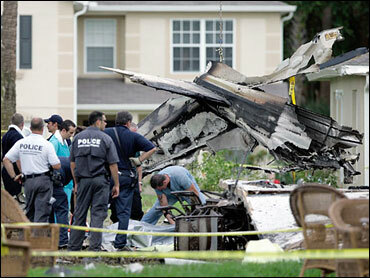 The plane was registered to Competitor Liaison Bureau Inc. of Daytona Beach. Online records from the Department of State Division of Corporations show the company is registered under the name of William C. France, the NASCAR chairman who died last month at age 74 at his Daytona Beach home. "Our deepest sympathies and prayers are with all of those who were involved in this tragic accident and their families," NASCAR said in a statement. Lesa France Kennedy, whose husband died in the plane crash, is France's daughter. International Speedway Corp., of which she is president, owns or operates 13 of the nation's major motorsports facilities, including Phoenix International Raceway. Gov. Charlie Crist said Bruce Kennedy was a great friend. "When I went to the Homestead race, he was kind enough to take me around to meet the drivers. He was gracious beyond words," Crist told The Daytona Beach News-Journal.